전공필수선택 LIET 201 생태학 3(3) 생물과 환경과의 상호 관련성을 알아보고, 개체군, 군집 및 생태계에서 구조와 기능을 강의한다. 전공필수선택 LIET 206 물환경학 3(3) 본 과목은 물순환과 수자원, 그리고 강과 호수, 지하수 환경에서의 수질오염에 대하여 강의한다. Water and the Environment This course covers water cycle and water resources, and water pollution in rivers, lakes and groundwater environment. 전공필수선택 LIET 219 환경조경학 3(3) 인간을 포함한 모든 생물과 무생물이 공생. 공존할 수 있도록 지구환경을 보존. 보전. 복원, 개발하는데 필요한 실천적 이론과 기술의 기초를 배운다. INTRODUCTION TO ENVIRONMENTAL PLANNING AND LANDSCAPE ARCHITECTURE Basic studies on the definition, scope, goal and methodology of environmental planning and landscape architecture for the quality of life through the best design of the site. 전공필수선택 LIET 222 환경화학 3(3) 환경오염물질의 대기, 수, 토양, 생물체 등 생태계 구성요소에서의 거동을 이해하기 위한 기초화학이론을 살피고, 물질의 변환과정을 화학적으로 이해시킨다. 아울러 오염물질의 처리과정에 이용되는 화학반응의 원리와 개념에 대해서도 토의하고, 문제풀이를 통해서 이해도를 높이도록 한다. ENVIRONMENTAL CHEMISTRY The chemical mechanism of environmental pollutants production and their fate in environment, especially the fate of pollutants in soils. The transformation of materials in environment and in the reaction of environmental treatment techniques are discussed through chemical principles. 전공필수선택 LIET 225 환경미생물학 3(3) 환경미생물에 관련된 중요한 미생물을 찾아내고 다른 환경에서의 미생물의 특징과 이들의 환경에서의 활동을 모니터링 하는 방법을 연구하며 인간 활동에 유용한 미생물의 역할에 대하여 공부한다. 이 과목은 기초적인 환경 미생물학적 지식을 전달하고 환경 분야에서의 미생물의 역할을 분자 미생물학 기술을 이용하여 알아내는 방법에 대하여 공부하고자 한다. ENVIRONMENTAL MICROBIOLOGY This course deals with the history and applications to human beings of microbial resources. Main topics are industrial use, environmental application, role in ecosystem, collection and preservation, construction of international network, production and development, and related items. 전공필수선택 LIET 226 환경재료과학 3(3) 원료 측면의 생물환경재료인 목재 및 목제품과 생분해성 플라스틱의 제반 특성과 제조공정, 용도 측면의 생물환경재료중 하나인 목재 기생균류의 효소 분해체계와 이들의 산업 및 환경적 이용에 대하여 강의한다. 전공필수선택 LIET 227 환경과학 3(3) 본 과목은 인구 증가, 환경오염, 자연자원의 감소와 관련된 환경문제와 지속가능한 미래를 위한 환경문제 해결방안에 대하여 강의한다. Environmental Science This course covers environmental problems including human population growth, environmental pollution and loss of natural resources that we face, and potential solutions to these problems for our sustainable future. 전공필수선택 LIET 229 환경 토양학 및 실험 3(4) 환경과학 기초과목으로서, 토양의 생성/분류와 물리화학적 성질에 대한 기초와 토양보전, 토양생태계 및 토양의 환경적 의의에 대하여 강의하고 관련된 실험을 수행한다. Environmental Soil Science and Laboratory As a basic knowledge for environment science, lectures will be focused on physical, chemical, biological and mineralogical phenomena occurring in soil system. This course will also include soil conservation, environmental aspect, and related experimental works. 전공필수선택 LIET 232 환경생태학 3(3) 인간 활동이 환경에 미치는 영향을 생태학적 관점에서 이해하며 생태학 기본 이론으로 설명한다. 인간의 활동에 의해 생성된 오염물질/교란등의 생태적 영향을 기술하고 또한 생태계가 인간사회에 제공하는 생태학적 자원과 서비스를 정량적 관점에서 논의한다. Environmental Ecology This course provides an overview of man's impact on the environment. Basic ecological principles are examined in the context of man's interaction with the biosphere. The ecological effects of pollution and other man-made disturbances are described. Also, the diverse roles of ecological resources and services on the human society will be discussed. 전공필수선택 LIET 235 환경GIS 및 실습 3(4) 환경자원관리에 이용되는 공간정보의 유형 및 특징을 기본적으로 강의하고, 공간정보관리를 위한 GIS를 실습위주로 습득시킨다. GIS를 이용한 환경자원의 조사, 모니터링, 계획, 의사결정, 관리기법 등을 사례중심의 실습으로 강의함으로써 GIS의 활용능력을 배양시킨다. Environmental GIS and Practice Types and characteristics of spatial information for environmental resource management are basically lectured, and GIS techniques for managing spatial information are practically trained. GIS applications for survey, monitoring, planning, decision making, and managing the environmental resources are learned with case practices. 전공필수선택 LIET 237 환경정보 및 계획학 실습 3(4) 환경계획 및 관리를 위해 필요한 각종 정보의 종류 및 유형, 구축 및 관리기법 등과 이러한 환경정보의 활용방안을 각종 환경계획과 연계하여 강의하고 실습한다. Environmental Information and Planning In this lecture, various types of environmental information, construction and management techniques, and how to use these environmental information are taught and practiced in connection with various environmental plans. 전공필수선택 LIET 241 바이오매스 이용학 3(3) 바이오매스는 탄소 중립적인 재생가능한 자원으로 화석연료나 화석연료 유래 화학물질들을 대체할 수 있다. 본 강의에서는 1세대, 2세대, 그리고 3세대 바이오매스에 기반한 생물공정 기술들을 포괄적으로 다루어 보고자 한다. Utilization of Biomass Biomass represents an abundant carbon-neutral renewable feedstock for production of fuels and chemicals, possibly replacing fossil fuels and petrochemicals. In this lecture, we will study on comprehensive reviews of bioprocessing technologies based on either 1st, 2nd, or 3rd generation of biomass. 전공필수선택 LIET 317 생태공학 3(3) 생태공학의 기본 원리인 에너지 흐름, 물질 순환, 자기 조직, 지속가능성에 관하여 강의하고, 생태공학 기술을 이용한 생태계의 계획, 시공, 관리를 고찰한다. Ecological Engineering Basic concepts of ecological engineering such as energy flow, nutrients cycle, self-design and sustainability will be introduced and considered. Design, construction and management of ecosystems by using ecotechnology also discussed. 전공필수선택 LIET 322 동물다양성과 보전 3(3) 본 강좌는 무척추동물 및 척추동물을 포함하는 동물계의 다양성을 유전자, 종 및 생태계의 관점에서 강의하고 동물다양성의 보전에 관한 최근의 이슈를 시청각 자료와 함께 강의한다. Animal diversity and conservation This course covers not only genetic, species and ecosystem levels of animal diversity but also current issues of the conservation. Audio-vidual materials will be used. 전공필수선택 LIET 324 자원순환공학 3(3) 다양하게 발생하고 있는 각종 폐자원 및 폐생물자원의 친환경적 처리를 위한 다양한 재활용 기술을 다룬다. Resource Recycling Technology Various recycling techniques of bio-based wastes with emphasis on wood-based wastes, agro-based wastes, and plastic wastes, and manufacturing processes for recycling products using bio-based wastes. 전공필수선택 LIET 349 환경영향평가 3(3) 환경자원의 이용 및 개발에 수반되는 환경영향평가의 이론 및 기법을 강의한다. ENVIRONMENTAL IMPACT ASSESSMENT Lectures on theories and methods of environmental impact assessment accompanied by use and development of environmental resources. 전공필수선택 LIET 363 환경생물공학 및 실험 3(4) 미생물을 이용하여 폐수, 토양, 폐기물, 폐가스 등에 포함된 환경오염물질을 분해 또는 변환시키는 기술을 다루는 학문으로서 최근의 생물공학적 환경정화기술 대한 기본개념 및 응용에 대해 학습한다. Environmental Biotechnology and Laboratory This course will introduce the use of microorganisms to solve current main areas of environmental problems - wastewater, soil contaminants, solid waste and waste gas -consecutively dealing with both the microbiological process and engineering concepts and their respective applications. 전공필수선택 LIET 367 환경과 디자인의 이해 및 실습 3(4) 환경과 디자인의 이론 및 중요성에 대해 고찰함으로써 디자인이 사람과 장소에 어떻게 영향을 미칠 수 있는 지를 학습한다. 본 교과는 다양한 유형의 계획과 설계를 비판적으로 검토하는데 도움이 되는 지식을 습득하는 것을 목적으로 한다. 이 과정은 물리적 환경과 사회적 환경에 대한 이해를 높이고, 오픈스페이스에서 환경디자인을 적용하는데 필요한 이해력을 향상시킬 것이다. Understanding of Environmental Design The course reviews principle concepts and its importance of the environment and design, the process and products, and how design can influence people and places. You should complete the course having gained knowledge that will help you to contribute to a design process and be able to critically examine various types of plans and designs. The course should provide you with a better understanding of physical and social environments and the role that open spaces can play in sustaining them. 전공필수선택 LIET 370 조경표현기법 및 실습 3(4) 조경설계의 선수과목으로서 설계에 대한 기초적인 원리와 설계에 대한 이해를 돕기 위한 수업이다. 설계의 기초가 되는 기본적인 설계이론과 설계언어 및 다양한 3차원 표현기법을 습득하고, 공간에 대한 이해와 해석 능력을 배양하여 설계에 대한 관심과 흥미를 유발하고 창의적인 표현력을 개발 발전시킨다. Landscape Presentation and Practice Pre-requisite course for landscape design studio. Through a series of studio exercises, assignments, critiques, and lectures/demonstrations, this course will teach students the skills, vocabulary, and materials used in drawing from direct observation. It will also introduce to students basic concepts and principles of design for landscape architecture. 전공필수선택 LIET 372 생태계생태학 및 실험 3(4) 생태계의 구조와 그 안에서 일어나는 에너지 및 물질의 순환 과정을 알아보고, 실내 및 실외 실험을 통하여 이를 확인한다. Ecosystem Ecology and Laboratory Nature of ecosystem science, mechanisms controlling ecosystem structure and function, and human influences on ecosystems. 전공필수선택 LIET 374 조경계획및실습 3(4) 조경계획이론 강의를 통하여 계획개념과 접근방법 및 계획과정에 대한 이해를 갖게 하고, 자연․인문환경의 조사분석, 개발규모의 산정, 시설 배치 및 대안의 평가등 계획과정을 설명하고, 자연공원, 도시공원, 테마공원, 레크리에이션 시설, 시설 조경 등의 부분별 조경 계획을 연습한다. Landscape Planning and Practice The concept, program development, and planning process of landscape architecture. Survey and site analysis of natural, built environments, site-structure plan, alternative plan, and conceptual plan. Practices on landscape architecture planning about natural park, urban park, theme park, recreation area, and facility planning. 전공필수선택 LIET 382 응용미생물학 및 실험 3(4) 응용미생물학 및 실험과목은 기초미생물부터 산업미생물학 등 미생물을 이용한 다양한 응용 분야를 소개하고 이들 분야의 기본 원리와 산업화를 위한 방법 등을 공부한다, 또한 배양학적, 분자생물학적 기술을 이용하여 생물막형성, 항생제내성, 유류분해, 쿼럼센싱, 효소반응 등의 미생물학적 기초실험을 수행한다. Applied Microbiology and Laboratory Applied Microbiology and Lab course will cover the area ranging from basic microbiology to industrial microbiology. Especially, we will focus on molecular mechanisms and learn how to industrialize all those microbial processes. We will do basic laboratory experiments including biofilm, antibiotic resistance, oil degradation, quorum sensing, enzyme reaction using culture-dependent and culture-independent methods. 전공필수선택 LIET 405 환경생태공학세미나 I 1(1) 본 과목은 환경과학 및 생태공학 분야의 최근 연구 및 산업 현황에 대한 강의로 봄학기에 진행된다. Department Seminars I This course for the spring semester covers up-to-date status of research and industry in the field of environmental science and ecological engineering. 전공필수선택 LIET 406 환경생태공학세미나 II 1(1) 본 과목은 환경과학 및 생태공학 분야의 최근 연구 및 산업 현황에 대한 강의로 가을학기에 진행된다. Department Seminars II This course for the fall semester covers up-to-date status of research and industry in the field of environmental science and ecological engineering. 전공필수선택 LIET 407 연구논문지도 1(2) 환경생태공학 분야의 실험 연구를 대상으로 학부 졸업논문 작성법을 지도하고 졸업논문 발표를 통하여 평가한다. Thesis research This lecture provides a guide to prepare and present thesis research relating to environmental science and ecological engineering. 전공필수선택 LIET 408 생태복원공학 3(3) 본 과목은 산업과 도시의 발달로 인해 심각하게 훼손된 생태계를 복원하기 위한 여러 가지 이론과 공학적 기술들에 대하여 강의한다. Ecological Restoration Engineering This course covers theories and techniques for restoration of damaged ecosystems induced by rapid development of industry and human society. 전공필수선택 LIET 413 도시조경설계및실습 3(4) 도시공간내 생태환경의 보존과 이용자 편의성의 조화를 통해 생태계서비스를 제공할 수 있는 조경설계 과정을 익히도록 한다. Urban Landscape Design and Practice The student will begin to explore and develop design processes utilizing graphic skills learned from pre-requisite courses. They will be acquainted with the basic elements and principles of design organization and explore their application to the design of outdoor furnitures and landscape facilities. 전공필수선택 LIET 414 생태조경설계및실습 3(4) 본 과목은 조경 연구와 기후변화, 자연 재해 및 생태학적 문제에 대한 혁신적이고 진취적인 해결방안을 강조하는 설계 실습에 중점을 두고 있다. 수강생은 생태조경설계와 계획의 개념부터 시스템 사고, 대도시 및 농촌 경관의 생태적 성과에 대한 기본 이론을 전반적으로 탐구한다. 또한 자신의 디자인에 적용함으로써 최근 조성된 생태적 디자인의 의미와 비교함으로써, 조경의 미학적, 기능적, 과학적, 경제적 측면과 설계/계획/관리 선택 사이의 연결고리를 찾아내는 과정을 연습한다. Ecological Landscape Design and Practice This course focuses on the interaction of landscape research with the necessities and mechanisms of design practice and performance emphasizing innovative and forward thinking solutions to climate change, natural disaster, and ecological problems. Starting with conceptual frameworks in ecological design and planning, students will review primary literature about system thinking, ecological performance in metropolitan and rural landscapes, and compare it with ecological design implications of their own design work or recent built work. In addition, this course emphasizes the link between critical landscape research aspects (i.e. aesthetic, functional, scientific, economic) and design/planning/management choices. 전공필수선택 LIET 415 식물환경학II 및 실험 3(4) 본 교과목은 식물생리학 내용을 바탕으로 식물이 다양한 환경 스트레스에 대한 반응과 주요 기작과 관련한 지식을 습득하는 것을 목표로 하며, 실제 중금속 오염 토양에서의 식물 재배 및 분석을 통해 직접 확인하는 실험수업을 병행한다. Plant & Environment II and Experiment This course aims to acquaint the students with the knowledge about plant response to various environmental stresses and major mechanisms based on the plant physiology. Experiments are conducted through plant cultivation and analysis in soil contaminated with heavy metals. 전공필수선택 LIET 436 시스템생태학 3(3) 생물계와 생태계간의 혹은 그 안에서 일어나는 상호작용을 총체적인 관점에서 이해한다. 전공선택 LIET 214 실험설계 및 분석 3(3) 가설 검정을 위한 실험설계의 이론, 실험설계의 방법과 획득된 자료의 통계학적 분석 방법에 대해 강의한다. Experimental Design and Statistical Analysis Theory of Experimental design for hypothesis testing, models and methods of experimental design, statistical analysis of the results of experiments. 전공선택 LIET 217 야생식물학 3(3) 산․들․생활주변․농경지 등에 발생하는 야생초본식물의 식별과 분류 및 관리에 대한 지식을 습득하여 자연환경생태에 관한 기초와 응용의 지식을 함양하도록 한다. WILD PLANT Identification, taxonomy and management of wild herbaceous plants for environmental ecology. 전공선택 LIET 221 미생물자원학 3(3) 미생물자원의 역사와 인간생활에서의 이용을 학습한다. 즉, 미생물자원의 산업적 이용, 환경적 이용, 생태계에서의 역할, 수집 및 보존, 국제적 네트워크, 생산 및 개발 등의 주제를 구체적인 사례를 통하여 학습한다. Microbial Resources This course deals with the history and applications to human beings of microbial resources. Main topics are industrial use, environmental application, role in ecosystem, collection and preservation, construction of international network, production and development, and related items. 전공선택 LIET 231 환경곤충학 3(3) 모든 생태계에서 일차 소비자와 분해자로서 에너지 유전과 물질순환을 담당하는 가장 중요한 생물 요소인 곤충의 일반적 특성, 곤충의 다양성과 곤충과 환경간의 상호작용의 진화에 대하여 중점적으로 토의한다. ENVIRONMENTAL ENTOMOLOGY The general characteristics of insects, insect diversity in ecosystems, and evolution of interactions between environment and insects. 전공선택 LIET 239 환경분석화학 및 실험 3(4) 환경 중으로 인입되는 대기, 수질, 토양오염물질 분석법의 기본 원리에 대하여 강의와 실험실습을 통해 익힌다. Analytical Chemistry & Laboratory for Environmental Science Students are expected to learn general gravimetric, volumetric, and specific analytical methods related to environmental sciences with the emphasis on fundamental theories, laboratory methods and procedures. 전공선택 LIET 292 목질재료과학 3(3) 목재의 거시 및 미시적 구조, 목재의 화학성분, 목재의 물리 및 역학적 성질을 철저히 이해시킴으로서 환경재료인 목재의 효율적인 고부가 이용을 가능하게 한다. INTRODUCTION TO WOOD SCIENCE AND TECHNOLOGY Understanding the basic knowledges of wood, including anatomical structure, chemical composition of wood, and physical and mechanical properties of wood for efficient and value-added utilization of wood. 전공선택 LIET 311 생태독성학 3(3) 환경에 투입되는 독성물질의 종류 및 영향을 식량생산에 관련된 화합물을 중심으로 강의하며 이들이 환경에 미치는 영향을 생물개체, 개체군 및 군집수준에서 평가하는 방법 및 분석방법 에 대하여 토의한다. Ecotoxicology Evaluation of fundamental processes relating fate and effects of chemical and heavy metal pollutants in the environment. Emphasis on effects of pollutants on the basis of individual, population and community levels in ecosystem. 전공선택 LIET 313 환경정책학 3(3) 환경에 대한 기초개념 및 사회경제적, 환경적 관련성에 대한 이해를 넓히고 국내적, 국제적으로 환경과 관계되는 문제에 대한 본질을 설명하고 정책방향과 정책수단에 대한 강의와 토론을 통하여 문제해결 능력을 배양한다. ENVIRONMENT POLICY Basic concepts about environment, social-economic environmental relationships between political goals and methods. Seminars on global and national environmental issues related with forest. 전공선택 LIET 326 재생에너지 3(3) 자연 상태에서 만들어지는 재생 가능한 에너지인 태양에너지, 풍력, 수력, 바이오에너지의 종류와 개발 기술 및 활용에 대하여 강의한다. Renewable energy A lecture on technology and application of renewable energy which comes from natural resources such as sunlight, wind, water and biomass. Agroecology This course will focus on This processes and interactions in agricultural systems and on ecological principles that can be integrated into agricultural management towards improved sustainability of agricultural systems and reduced environmental harm of food production at field, landscape and global scale. The complex social and ecological shifts that may need to occur will be discussed. 전공선택 LIET 331 식물생태학 3(3) 재배되는 식물인 작물의 발달과정과 현황을 파악하고, 식물의 생육에 미치는 토양환경과 기상환경 및 식물에 대한 반응에 대하여 강의한다. PLANT ECOLOGY Functional principles of plant production, and their relation to environments. 전공선택 LIET 332 식물자원학 3(3) 재배환경에 기초하여 작부체계, 종자와 육묘, 정지, 파종, 이식, 시비방법, 생육 중 관리, 재해방제, 생력재배, 수확 후 관리 등에 대하여 강의한다. PLANT RESOURCES Functional principles of plant production, and their relation to environments. 전공선택 LIET 338 생물재료화학 3(3) 생물재료의 주요 화학적 조성분의 구조 특성, 화학적 반응 그리고 이용에 관한 이론과 기술을 강의한다. 전공선택 LIET 339 환경생화학 3(3) 본 과목은 탄수화물, 지질, 단백질과 핵산 같은 생체물질들과 그들의 대사 및 환경오염이 생명체에 미치는 영향에 대하여 강의한다. ENVIRONMENTAL BIOCHEMISTRY This course covers biomolecules such as carbohydrates, lipids, proteins and nucleic acids, their metabolism in biological systems, and the effects of environmental pollution on living organisms. 전공선택 LIET 341 토양환경공학 3(3) 오염된 토양 시스템에서 발생하는 오염물질-토양-물 사이에 발생하는 물리, 화학, 생물학적 현상에 대한 기초적인 이해를 하고 이를 바탕으로 오염물질의 거동과 오염된 토양의 복원 기술에 대한 전반적 강의가 진행된다. SOIL ENVIRONMENTAL ENGINEERING This lecture is designed to introduce students to fundamental understanding on physical, chemical, and biological processes occurring in contaminated soil system. Contaminant fate in soil-water system and innovative technologies regarding soil-groundwater remediation also will be addressed. 전공선택 LIET 342 식물환경학I 3(3) 환경의 변화와 오염이 식물의 생리적 생태적 성질에 미치는 기본적인 메커니즘과 그 원리에 대하여 소개하고, 오염으로 인한 식물 피해에 대한 대책과 식물을 이용한 오염정화 및 생태복원에 대하여 강의를 통하여 이해시킨다. ENVIRONMENTAL PLANT PHYSIOLOGY Ⅰ Introduction to the effects and mechanism of environmental pollution on the physiological and ecological properties of plants and the countermeasure for pollution. 전공선택 LIET 351 환경수목학 3(3) 자연환경에서 목본식물이 차지하는 역할과 중요성을 강의하고, 우리나라 자생 또는 도입된 외래종 가운데 주요 목본식물의 명칭, 분류, 형태, 습성, 분포 및 용도 등을 설명한다. 전공선택 LIET 354 수서생태학 3(3) 수서 생물과 환경과의 상호작용을 개체, 개체군 및 군집수준에서 연구한다. AQUATIC ECOLOGY The interaction between aquatic organisms and their environments. Exploring fundamental ecological processes in aquatic systems at individual, population, community and ecosystem scales. 전공선택 LIET 356 목질주거환경 3(3) 주거환경에서 목질계 재료 사용이 인간의 건강, 생리, 심리, 정서발달에 미치는 영향에 대하여 강의한다. WOOD-ENVIRONMENT SCIENCE The effect of wood and wood-based materials used in living environments on human health, physiology, psychology, and the development of emotion is investigated. 전공선택 LIET 365 목재보존과학 3(3) 목재 및 목제품의 물리, 화학, 생물학적 열화기작 파악하고, 목재열화를 예방할 수 있는 제반 보존처리기술과 보존제 및 보존처리목재의 친환경적 사용 및 폐기문제를 다룬다. Wood Protection Degradation mechanism of wood and wood products by physical, chemical, and biological agents, and various protection techniques for preventing degradations with emphasis on environmental impacts of wood preservatives and preservative treated. 전공선택 LIET 375 조경식물 및 정원설계실습 3(4) 환경개선 및 삶의 질의 향상을 위하여 주 소재로 이용되는 조경식물의 생리. 생태적 특성, 조경적 특성, 관리 등을 교육하고, 정원설계, 시공에 활용할 수 있도록 실습한다. Landscape Plants and Garden Design Practice Studies on the ecological and physiological characteristics of landscape plants for using to the design and construction to improve the quality of life. 전공선택 LIET 376 균류학 및 실험 3(4) 균류 및 유사균류의 분류, 형태, 생리, 생태, 유전 등 생물학적 성상을 학습하고, 이들의 이용 및 다른 생물과의 상호관계를 이론과 실습을 통하여 익힌다. 특히 자연계의 물질분해자로서의 균류를 학습함으로써 생태계의 순환원리를 이해하는 데 도움을 준다. 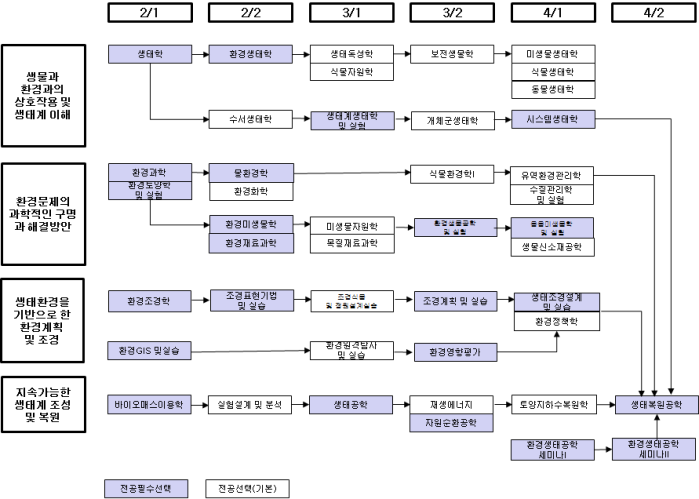 전공선택 LIET 377 조경 컴퓨터그래픽실습 3(4) AutoCAD와 기타 컴퓨터 응용프로그램을 이용하여 설계도면 작성에 필요한 기술과 응용능력을 습득하고, 이를 바탕으로 조경설계 과정을 연습한다. Computer Aided Design and Computer Graphic This course introduces students to the use of computer graphic software in Landscape Architectural Design. It develops basic applied computing skills in AutoCAD and other softwares. This class will also introduce students to the site design process. 전공선택 LIET 378 환경원격탐사 및 실습 3(4) 환경자원의 각종 조사기법과 이를 위한 원격탐사 및 영상처리의 이론을 기본적으로 강의한다. 또한, 항공사진 및 위성영상자료로부터 각종 환경관련정보를 추출해 낼 수 있는 판독 및 분류기법, GIS와의 연계한 활용방법 등을 사례중심의 실습으로 습득시킨다. Environmental Remote Sensing and Practice Survey methods of environmental resources, theories of remote sensing and image processing for environmental resource survey are basically lectured. Interpretation and classification techniques to get environment-relevant informations from aerial photograph and remote sensed data, application techniques with GIS are learned with case practices. 전공선택 LIET 380 개체군생태학 3(3) 생태계의 생물적 요소인 개체군의 특성, 성장, 타 개체군과 상호작용에 대하여 논의하고 이를 토대로 군집과 생태계의 형성과 발전과정을 토의한다. Population Ecology The interrelationships among living organisms and components of their effective environments which result in dynamic spatial and temporal patterns of particular species. Also, the diverse roles of organisms in structure and function of communities and ecosystems will be discussed. 전공선택 LIET 384 환경식재설계 및 실습 3(4) 조경식물을 이용하여 설계대상 부지에 미적, 생태적, 문화적, 기능적 측면을 고려한 설계과정과 적용에 대해 총체적으로 접근한다. Landscape Planting Design and Practice Studies on the theories of landscape planting design from the view-points of functional, aesthetic, ecological and cultural aspects as of the holistic design with landscape plant materials to conserve and improve the environment and practices with some case sites. 전공선택 LIET 393 산림환경조성 및 경영학 3(3) 임목과 식생을 비롯한 산림 수자원, 야생동물 등 다양한 가치를 지니는 산림환경자원을 조성, 유지 및 경영하는 원리와 방법을 강의한다. 전공선택 LIET 409 수질관리학 및 실험 3(4) 본 과목은 기본적인 수질특성과 물재이용 및 수질오염 방지를 위한 정화기술들을 강의하고 관련된 실험들을 실시한다. Water Quality Management & Laboratory This course covers basic characteristics of water quality, treatment technologies for water reuse and pollution control, and related experimental works. 전공선택 LIET 411 폐생물자원리사이클링 3(3) 폐생물자원(목질계 폐자원 및 농산 폐자원) 및 폐플라스틱의 친환경적 처리를 위한 다양한 고부가 재활용 기술을 다룬다. Bio-based waste recycling Various recycling techniques of bio-based wastes with emphasis on wood-based wastes, agro-based wastes, and plastic wastes, and value-added manufacturing processes for recycling products using bio-based wastes. 전공선택 LIET 430 미생물생태학 3(3) 자연생태계에서 물질순환에 기여하는 세균 및 진균류의 역할을 이해함으로써 미생물의 생태적 역할을 학습한다. 특히 산림환경 및 농업환경에서 미생물의 유해한 역할 및 유익한 역할을 평가하고 이들의 효과적 이용을 탐구한다. MICROBIAL ECOLOGY Microbial Ecology is the study of the relationships or interactions of microorganisms between themselves and also their environment including both abiotic and biotic components. This course deals with the role of fungi and bacteria which contribute to the recycling of materials in natural environment. Their roles in terrestrial and aquatic environment and relationship with plants and animals are also included. 전공선택 LIET 432 학술림연구 세미나 2(2) 고려대학교 학술림(임업경영을 위한 학술적 시험연구의 장으로 활용되고 있음)을 대상으로 수행된 다양한 연구에 대한 세미나를 통해 연구설계, 자료수집 및 분석, 결과 및 고찰 유도, 보고서 및 논문작성 방법 등을 학습시킨다. 또한 학술림을 대상으로 연구를 직접 수행하고 그 결과를 발표케 함으로써 독자적인 연구수행능력을 배양시킨다. 전공선택 LIET 434 환경유기화학 3(3) 유기오염물질이 환경 내에서의 동태에 영향을 미치는 기초적인 환경특성과 반응을 토양 및 용액의 화학에 초점을 맞추어 강의한다. 오염물질의 동태를 예측하는 실용적인 측면은 물론이거니와 개념적이고 이론적인 측면도 강의한다. 전공선택 LIET 437 유역환경관리학 3(3) 본 과목은 유역에서의 수문현상, 오염물질의 거동, 그리고 유역환경관리 기법에 대하여 강의한다. WATERSHED MANAGEMENT This course covers watershed hydrology, fate and transport of pollutants, and watershed management techniques. 전공선택 LIET 453 동물생태학 3(3) 동물과 환경과의 상호작용을 학습한다. 환경요인들이 동물 개체군 구조 및 행동에 미치는 영향 및 이들의 보전에 관한 연구. ANIMAL ECOLOGY Major environmental factors affecting animals, structure and behavior of animal populations, regional animal communities, and their conservation. 전공선택 LIET 454 보전생물학 3(3) 종, 군집, 생태계에 대한 인간 활동의 영향을 이해하고, 종의 멸절을 방지하기 위한 실질적인 제반 방법을 강의한다. CONSERVATION BIOLOGY Understanding the effects of human activities on species, population and ecosystem, and developing practical approaches to prevent the extinctions of species. 전공선택 LIET 456 환경위해도평가 3(3) 인간 활동에 의해서 환경에 투입되는 여러 가지 화학물질 및 형질전환 생물들의 환경에 대한 위험요소를 관리학적 및 생물학적 측면으로 나누어 강의한다. PRINCIPLE OF ENVIRONMENTAL RISK ASSESSMENT Principles and theories of analyzing environmental interactions of chemicals in environment. Critical analysis of methodologies for assessing the ecological impacts on the environment by chemical pollutants caused by human activities. 전공선택 LIET 463 생물학적페기물처리 3(3) 생물학적폐기물처리는 생물학적 폐수처리, 생물학적 오염복원과 그 이외의 환경 보건 분야, 산업공정생물학, 폐기물의 이동 및 독성학 등의 기본원리를 공부하고 특히 미생물을 이용한 폐기물과 폐수처리공장을 견학하고 원리를 공부한다. 이 과목은 환경과학과 환경공학의 학생들에게 폐수처리의 생물학적인 방법에 대하여 심도 깊은 내용을 제공할 것이며 현재의 생물학적 폐기물처리 전반에 걸친 토론을 한다. BIOLOGICAL TREATMENT OF WASTE Biological treatment of waste is highly recommended, but still expensive and difficult in practical use. This course covers the history, present problems, improvement methods, and future technologies to be developed. 전공선택 LIET 467 토양지하수복원학 3(3) 오염된 토양/지하수 환경을 평가, 복원, 관리하는 위한 여러 가지 이론과 기술을 논의한다. 또한, 국내 토양지하수 복원관련 정책과 제도에 대해서도 소개한다. Soil and groundwater remediation Theories and technologies for the assessment, recovery, and management of contaminated soil/groundwater are discussed. Also national policy and system related to soil/groundwater remediation is introduced. 전공선택 LIET 469 생물신소재공학 3(3) 세균, 균류를 비롯한 미생물들의 세포와 이들의 생리적 기작을 이용한 새로운 기능성 화합물의 분자설계 및 합성과 유기물질의 기능성 소재로의 생물학적 전환 등의 분야를 탐구하고 특히, 에너지고갈시대에 대처할 미래 바이오에너지 및 생물소재 산업의 연구와 경향에 대하여 학습하고 토의한다. BIO-BASED PRODUCTS ENGINEERING This course mainly covers a development of novel functional compounds, especially, a bioconversion of organic compounds into valuable products using microbial cells and its physiology. We also discuss production of future bio-energy and related industries that will be an important issue in future energy-demanding society. 전공선택 LIET 472 자연환경재난관리학 3(3) 자연환경에서 발생하는 각종 생물 및 비생물적 재난의 원인규명, 예찰, 피해평가, 방재, 복구방안 등에 대해 강의한다. NATURAL ENVIRONMENTAL DISASTER MANAGEMENT Techniques on tracing the cause, forecast, prevention, damage assessment, prevention, and ecological restoration of biotic and abiotic disasters originated in natural environment are lectured. 전공선택 LIET 490 환경법규 3(3) 환경법의 일반이론과 개념, 우리나라의 환경법과 제도, 개별 환경행정법의 내용을 강의하며, 현행 법률과 해외 환경법과를 비교 제시함으로써 국내 환경법 및 행정절차에 대한 이해를 구하도록 한다. ENVIRONMENTAL LAW AND REGULATIONS Concept of environmental law, the Korean law of environment and the laws on the environmental management of foreign countries. 전공선택 LIET 492 지역 및 도시계획학 3(3) 지역 및 도시계획의 특징 및 계획수립이론, 지역 및 도시개발과 관련된 토지, 주택, 교통, 환경문제에 대한 해결방안, 사회경제적 발전을 위한 정책대안 등을 강의한다. REGIONAL AND URBAN PLANNING Characteristics and theories for regional and urban planning, solutions for problems in land, house, transport, environment accompanied by regional and urban development, policy alternatives for socio-economic development are lectured. 전공선택 LIET 494 경관생태학 3(3) 여러 개의 생태계를 포함하는 경관에서 매 생태계의 크기, 형태 및 구성 등과 같은 생태계 구조와 여기에서 일어나는 물질, 에너지, 종의 이동 등의 제반 생태계 현상을 강의한다. 전공선택 LESE 302 환경경제학 3(3) 자연자원과 환경에 대한 경제이론 및 정책문제를 강의하고, 이용?개발?보전에 영향을 미치는 경제적?제도적 요인을 분석하며, 세대간 자원관리문제와 자연환경문제에 대한 자원정책 이론과 기법을 응용하는 능력을 배양한다. ENVIRONMENTAL ECONOMICS Economic theory and policy issues on natural and environmental resources. Analysis on economic and institutional factors affecting on the use, conservation and preservation of natural resources. Application of policy tools to the intertemporal resource allocation and environmental problems. 전공선택 KHES 215 환경보건학 3(3) 화학적, 물리적, 생물학적 환경변화에 따른 인간의 건강영향과 대처방안을 인지하도록 강의한다. 전공선택 ACEE 226 환경공학1 3(3) 환경오염 물질이 발생, 원인, 확산, 처리, 처분, 복원 공정에 대하여 공부한다. 공정에 관련된 물리적, 화학적, 생물학적인 원리에 대한 이해를 도모할 것이자. 전공선택 ACEE 327 환경공학2 3(3) 환경공학문제에 있어서의 기초적인 생태계의 원리, 오염물질의 물리 및 화학적인 특성, 미생물의 분해와 성장특성을 하천, 호소 등을 대상으로 강론하며 유량측정법, 수질분석법, 정수 및 폐수처리방법 등과 관련된 기초적인 사항을 포함한다. 전공선택 SOCI 255 환경사회학 3(3) 인간, 사회조직, 환경 사이의 상호관계를 이론적으로 검토하고, 사회문제로서의 환경문제에 대한 진단과 총체적 대안들을 습득한다. ENVIRONMENTAL SOCIOLOGY Examines interaction between society and environment. Issues such as population and resources, economic development and the environment, energy, and the environment are discussed.